Wow...I am so giddy for Friday to be here. I think my giddiness, however, is making the week going by at a snail's pace! Anyways...I had a totally different post planned for today, BUT, life got in the way. I've said it time and time again on this blog--I don't live to blog, rather I blog about my life. Last night life had bigger things to offer than writing my planned post. Let me explain...my friend Caroline and I have started a bit of a "wine night in" tradition. About every month or so, she'll come over for a girls' night in. Yoga pants are welcome and we alternate who provides the wine and food...one of us will get takeout and the other will get a bottle of wine. It was my turn for food and rather than going the takeout route, I opted to make grown up grilled cheeses. The reason being that we recently got this baby. I was dying to make a grilled cheese on our new skinny grill! Don't you just love the panini-like stripes!? I first saw the Le Creuset Skinny Grill in the Sur La Table catalogue a month or so back and have been wanting one ever since. On a recent trip to the store, they had the Skinny Grills marked down to $80 from an original $145. It was a no brainer...we had to have it! Not to mention friends, you're in luck--it's still currently on sale for $79.95 on the Sur La Table site here. That being said, I decided on one of my favorite grown up grilled cheeses: whole grain bread (in my eyes, there is no other option than grainy bread for a grilled cheese), baby swiss cheese, honey maple ham, and arugula. Dinner was of course accompanied by lots of girl talk...and some cab sav. Caroline brought this Cellar No. 8 Cabernet Sauvignon and I loved it! Not to mention, the bottle is under $15! Win, win in my book! Any other recommendations of good, low cost wine? looks so good! I may have to get that grill! 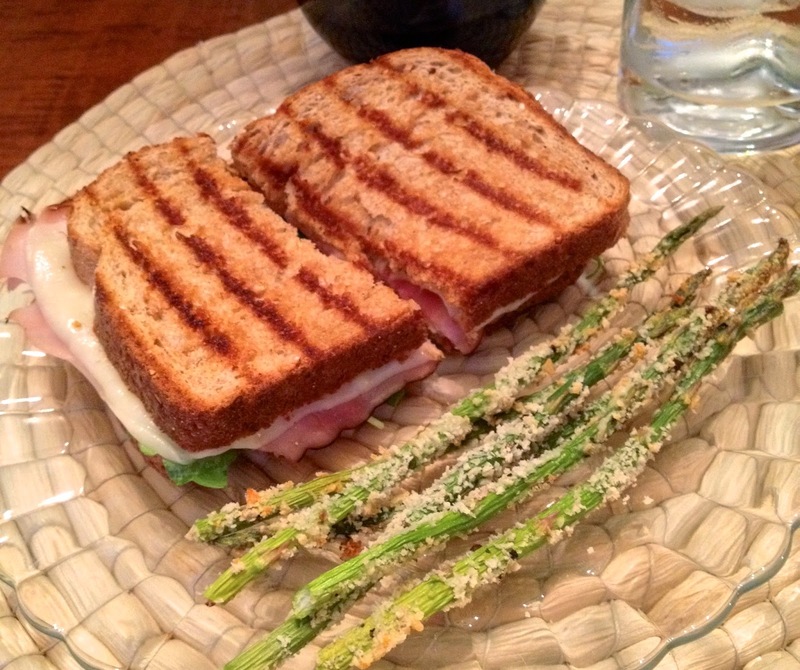 Try adding apple slices to your grilled cheese...so yum! Adult grilled cheese is one of the top meals in the Mill house! 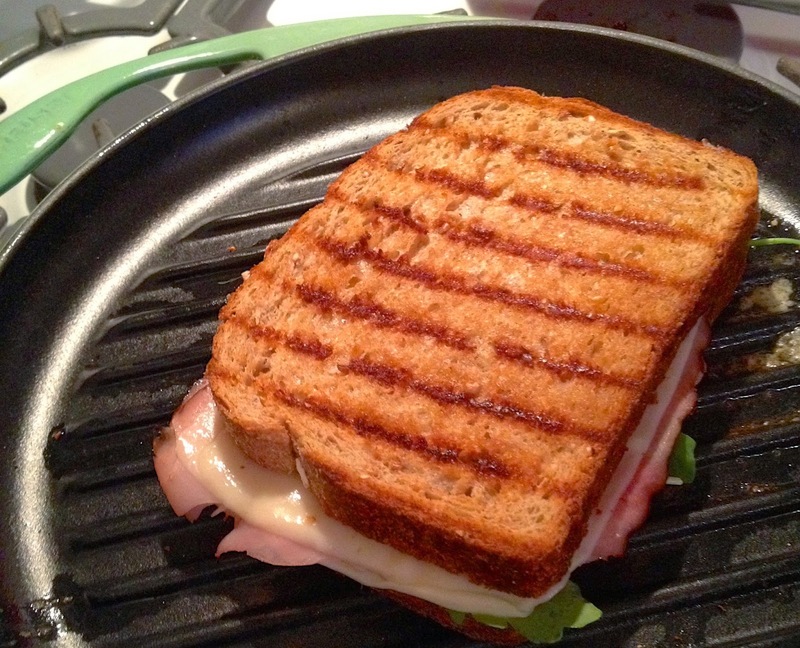 We have a panini press, but this griddle pan looks so handy! That looks great! I'll have to make that panini! Do have you Becker wines in VA? It's a Texas vineyard that makes some great wine! If you do, try the Becker Iconoclast Cab Sav. It's my favorite and about $10. Another low cost wine I like is the 14 Hands Merlot. Those sandwiches look so yummy & I am now thinking I need to invest in one of those grills! I went into a Sur La Table store for the first time over the weekend & it's safe to say I was in heaven! YUM. I love Cupcake wine but I'll have to try this one. That looks like the perfect dinner! This looks so yummy! I need to try out these asparagus fries- they look amazing! So excited for you and your mini getaway! Yum, I love grilled cheese. My favorite is brie with honey and pears. So, this is going to sound weird, but someone told me the other day that you can substitute mayo (or light mayo) for the butter on the outside of grilled cheeses. I tried it over the weekend and it's actually fabulous. Really crispy, actually. I was just going to ask where you got your "panini maker" but this is too cool! The lines make the sandwich, in my opinion! This looks so delicious! I think I need the Skinny Grill in my life!